/ Is There a “Blue Light” Mode on the Kindle Fire? Is There a “Blue Light” Mode on the Kindle Fire? My phone can filter out blue light at night. My computer can too. But can my Kindle Fire HD? It’s very cool how the research showing that blue frequency light messes with your sleep rhythms has made it into so many different devices and screens. From phones to laptops, Windows to Android, make a few changes to your settings and preferences and you can work on screens late in the evening and get to sleep before 3am too! On the Mac and on your iPhone, for example, the devices include a feature called Night Shift. On Windows it’s called Night Light. On Android you’ll find the feature’s called Night Mode. Whatever you call it, however, the good news is that there’s a similar feature on your Kindle Fire HD – and on any Kindle that has a color screen. In this instance, Amazon’s called it “Blue Shade”. Really! Let’s have a look as it’s really easy to enable. Crazy easy, actually. Now that you know the feature’s called Blue Shade, you can probably spot it on the shortcut menu. it’s third from the left on the first row of icons. Take a deep breath, then tap on it. Your screen goes, well, a bit weird! That’s Blue Shade at work, and by default it’s pretty radical, the maximum possible color shift. Probably too darn much, actually. Fortunately you can tweak and adjust things to match your needs and just how much “shift” you can stand. To do that, tap on the alert on the bottom of the pull-down. 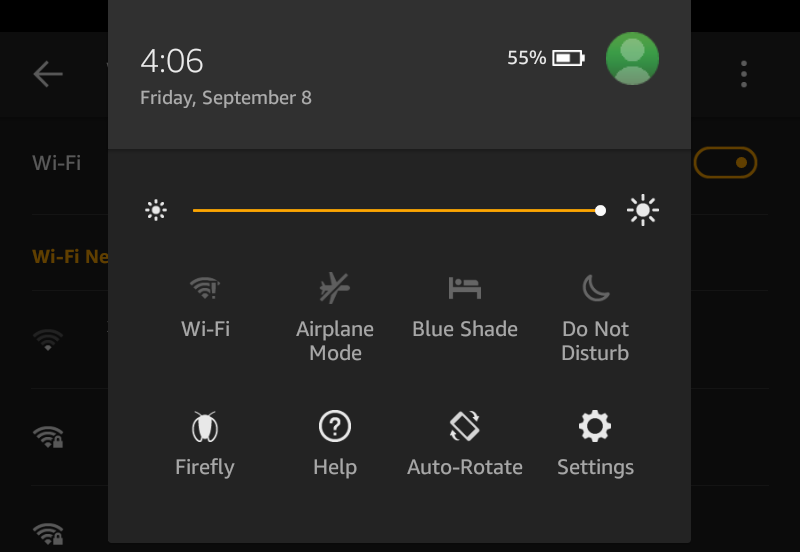 It says “Blue Shade – On” and actually also says “Tap for advanced settings”. 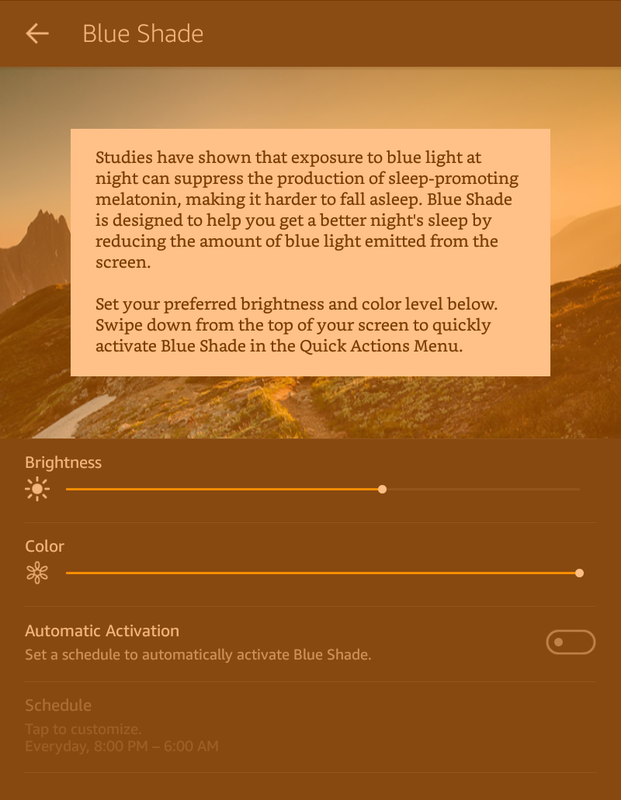 Use your finger to drag and check out the different Brightness and Color options. There’s quite a bit you can do to make it a bit less radical, but remember that how it looks in the middle of day isn’t indicative of how you’ll see it at 11pm while reading in bed. Starting at 8pm and turning off at 6am sounds good to me, so I’ll leave the default. Now, back to my ebook! Do all Kindle Fires offer the blue screen option or only the newer versions? I do not see a setting. Might be just the newer versions, Teresa.